On-farm research is central to this farm's yearly crop planning. When Ethan Zoerb and his dad, Dale, put together their crop plan each year, it is never the same. Whether comparing planting systems, hybrids or the latest crop protection products, the south central Nebraska irrigators are always trying something new and re-evaluating older ways of doing things. "You don't know something works or doesn't until you try it," says Ethan. For Ethan's part, he appreciates the recommendations he gets from Steiner, advice geared to making the operation a little more profitable. While multiple trials are on the horizon this year, what the Zoerbs won't be doing is concentrating a lot of different tests in one field. Last year a massive mid-August hailstorm hit several of their fields as it was winding down. "We lost the equivalent of two center pivots to hail and a couple of corn fields goosenecked from the wind," recalls Ethan. "The worst of it was that the soybean field we lost had most of our soybean research. It put us a year behind on our research." One of the comparisons that was wiped out was a side-by-side of the 30-inch row, strip-till soybean system they have used for the past 10 years with their new Monosem twin-row planter, running on 30-inch centers. Ethan says they went to the twin-row planter with the expectation of picking up another four to six bushels an acre. Although they went twin-row on about 85% to 90% of their beans, they wanted a direct comparison of the new and old systems. While the storm eliminated the chance to take the side-by-side to yield, Ethan likes what he saw with the twin-rows. "Our earliest soybean planting was April 25th with the goal of full canopy by June 21st, the longest day of the year," he says. "On the 21st, the twin rows were about three to four inches from canopy, while the 30-inch beans were closer to a foot from canopy." Ethan reasons that the closer his beans are to canopy on the longest day of the year, the more sunlight they are harvesting and the less weed pressure the crop will face. The hailstorm also eliminated yield checks on side-by-side soybeans. Zoerb wanted to verify any possible yield drag. While they also used an herbicide on beans, they didn't include it in the side-by-side. What doesn't bother Ethan is the control and lack of issues he saw with all three trait related herbicides in 2017. Not only did he have no problems moving from one to another, he also got excellent weed control with them as part of the farm's pre and post emerge applications. The key, he feels, is matching the herbicides to the weed pressure expected in the field. With problem weeds like Palmer amaranth, waterhemp and kochia, there is no one answer. Ethan is always looking for a better combination of products, and this year is no different. "We are looking at some different combinations, especially on soybeans," he says. "We want to do a better job layering residuals in both pre and post emerge. We need something to kill the weeds now but also to keep them from coming at least until the crops get close to canopy." When it comes to layering, he gives Zidua and Outlook from BASF as examples. 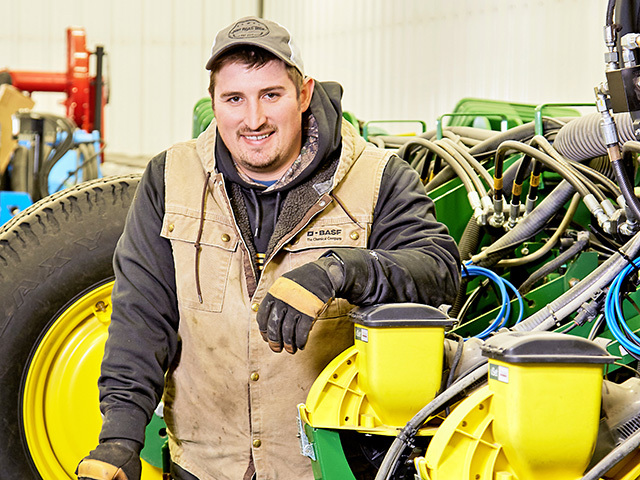 "Zidua and Outlook both give good immediate blanket control of similar weed spectrums, but layering Outlook with Zidua gives the extended residual control we are looking for," says Ethan. With most of their irrigated acres under center pivots, the Zoerbs make good use of chemigation, using it for multiple late season applications of nitrogen in addition to at planting and early sidedress. Multiple applications are an attempt to mitigate risk. "You can waste a lot of money on N if you get hit with an early season hail storm when it is too late to replant," says Ethan. "We used to apply based strictly on yield goal. This past year we started doing tissue testing to see where the levels are and if we can move them." Fungicides and insecticides are also split applied with an in-furrow treatment of Xanthion or Headline on earlier planted corn, as well as in-furrow insecticide. Soybeans get a dose of Priaxor in-furrow and again in a mix with the post herbicide application. If bean beetle or other pests are present, an insecticide gets added then as well. Corn also gets a V5 treatment of Priaxor with the final post herbicide and a third application around tassel of Headline AMP, generally through the center pivot. "We want to keep the plant as healthy and happy as we can with as much leaf area as possible into grain fill," says Ethan. "You never want corn to have a bad day. If it has a bad day, you've lost money." Apparent trait resistance by western bean cutworms is changing their rotation pattern and corn hybrid selection. "We are trying to get away from triple stack in corn," says Ethan. "Past trials have shown a yield drag, and the trait costs more. We're losing money twice. Instead, we use pheromone traps and monitor them closely." Evaluating the change will be one aspect of hybrid and variety comparisons this year, with seed corn coming from four to five different companies and soybean seed from three. Other plots in 2018 will include multiple biologicals, sugar products and more, including name brand products versus generics. "About anything we apply will have some kind of check," says Ethan. "We want to figure out the best and most economical way to do what we are doing."